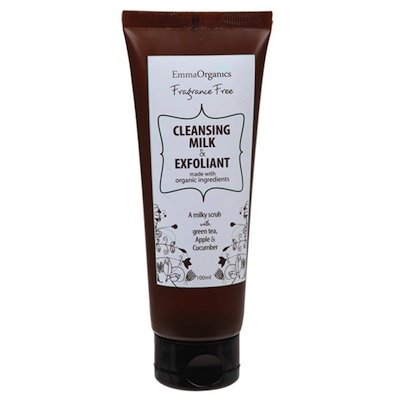 Emma Organics Double Action CLEANSING MILK AND EXFOLIANT, is a milky scrub and cleanser formulated to lift away surface impurities and makeup whilst scrubbing off accumulated surface dead skin cells, leaving the complexion clean, hydrated and smooth. Organic Jojoba, Avocado Oil, and Cocoa Butter - deliver long lasting hydration and soften the skin. INGREDIENTS: Purified Water (Aqua), Organic Aloe Vera (Aloe barbadensis) Juice, Cetearyl Olivate, Sorbitan Olivate, Pumice, Organic Coconut (Cocos nucifera) Water, Coco Glucoside, Organic Glycerine, Xanthan Gum, Organic Cocoa (Theodrama cacao) Butter, Parfum (Natural Preservative), Organic Avocado (Pesea gratissima) Oil, Potassium Sorbate, Citric Acid, Organic Jojoba (Simmondsia chinensis) Oil, Natural Vitamin E (Tocopherol), Organic Apple (Malus domestica) Extract, Organic Cucumber (Cucumis sativus) Extract, Organic Olive Leaf (Olea europaea) Extract, Organic Rosemary (Rosmarinus officinalis) Extract, Organic White Tea (Camellia sinensis) Extract, Tomato Seed (Solanum lycopersicum) Oil.